Join Us at the 2014 National School-Based Health Care Convention! Did you know that between 2010-2012, approximately $84 million in federal funds was awarded to support projects investigating patient-centered medical home (PCMH) but <1% of that money went to projects targeted for improvement of care for adolescents? Nationally, little attention has been given to address how the primary care patient-centered medical home model could be transformed to better meet the physical, sexual, and behavioral health needs of adolescents. To help generate knowledge and evidence to transform primary care to better meet the needs of adolescents, The National Alliance to Advance Adolescent Health (NAAAH) convened an invitational conference in 2012; and Brown University (BU), as part of a U.S. Health Resources and Services Administration grant, convened a Think Tank in 2013. The cross-disciplinary participants of these events identified a set of prioritized recommendations (NAAAH) to advance adolescent centered primary care and a practice model (BU) for adolescent-focused PCMH. Interested in learning more about this process and case studies from Michigan and Rhode Island detailing an adolescent-focused PCMH model in primary care? Join us at the 2014 National School-Based Health Care Convention Wednesday, July 2nd at 8am for our workshop, Building an Adolescent Focused Patient-Centered Medical Home Model – What Will It Take? Don’t forget follow us on Twitter (@RAAPS4teens) and tweet during our session using the hashtag #RAAPS. Together, let’s build momentum to demonstrate the value of this model in improving the health of adolescents! Posted in All Blog Post, News and EventsTagged Adolescent heath, patient centered medical home, PCMH, RAAPS, rapid assessment for adolescent preventative services, SBH4all, SBHCLeave a Comment on Join Us at the 2014 National School-Based Health Care Convention! While risk statistics provide invaluable insight into population behavior – all of us are dedicated to making a difference one individual at a time. And School Based and Linked Health Centers (SBLHCs) in the State of Michigan are making that difference – and then some. 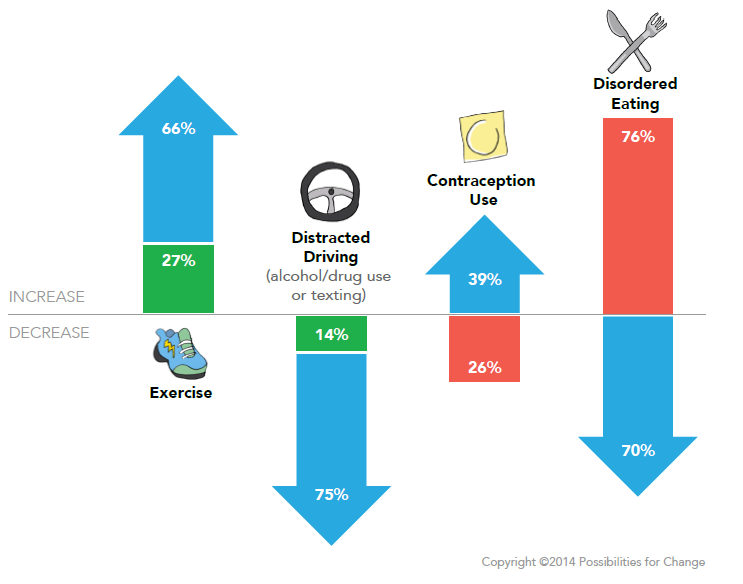 – Michigan SBLHCs were able to improve on already positively trending behaviors like exercise (from a population improvement of 27% to a 66% SBLHC user improvement) and distracted driving (from 14% population decrease to a 75% SBLHC user decrease in this behavior). To learn more download the full report by clicking here.